Sen. Heidi Heitkamp (D-ND) was always going to be in trouble. She barely won her 2012 election, clinching victory with less than 3,000 votes. North Dakota broke heavily for Trump in 2016. It’s a red state. She’s a Democrat. You know what the deal is here. I’ll be generous; perhaps Heitkamp could have squeaked by—maybe. She’s certainly a better bet in this scenario than Claire McCaskill (D-MO). Then, she stepped on a rake and made a blunder that very well could have her updating her resume in a few weeks time. A group of 22 women is considering filing legal action against Heitkamp. With 20 days until Election Day, it seems there’s little time to fix this error—and Heitkamp is already trailing Cramer by close to double-digits. On CNN’s Inside Politics Today with John King, Politico’s Rachael Bade said Heitkamp is going to pay with voters for this error, with Associated Press’ Catherine Lucey adding there’s not much she can do to save her seat, given the time constraints we’re dealing with here. An already tenuous bid for a second term has taken on new urgency for Heitkamp since she voted against Brett Kavanaugh’s confirmation to the U.S. Supreme Court. Heitkamp is scrambling to find her footing amid fears that the race against Republican Rep. Kevin Cramer is slipping away, and with it Democrats’ slim hopes of a Senate majority. 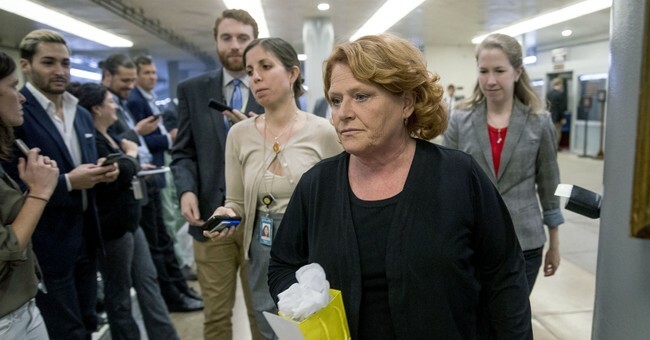 Heitkamp has been betting for months that her image as an independent collaborator — someone who could go along with President Donald Trump, but challenge him when needed — could carry her to another term in GOP-heavy North Dakota. Trailing in polls, including her own campaign’s, with three weeks until Election Day, Heitkamp plans to essentially camp out in North Dakota, especially its more politically independent eastern side.